A nutritionist, author and traveler dedicated to merging ancient healing wisdoms with modern western nutritional science, most of the wisdom I’ve learned has been in the field while studying alongside Ayurvedic doctors, Balinese bone healers, Shamans, herbalists and other specialists in from spots that range from South America to Asia. I credit a few special destinations with making a deep impact on my work, each of them perfect for relaxing your body and mind — making it easier to invite more serendipity into your life. 1. Ubud, Bali. If you’re on your own personal Eat, Pray, Love journey, Ubud is for you! This central Balinese city is a healers paradise, and the place I wrote my first book, Eat Right For Your Mind-Body Type. A typical day in Ubud is full of back-to-back vinyasa and yin yoga classes at the Yoga Barn, a delicious vegan brunch complete with a coconut the size of your head, an afternoon of creative writing, followed by your choice between Vedic astrology or conscious relationships workshops, completed with a night of sweaty ecstatic dance, a grounding sound bath and more fresh vegan cuisine. We call it Ubudtopia for a reason; mind-body healing is your full-time job in this paradise. 2. Chiang Mai, Thailand. If ceremony and reflection are what you're craving, Chiang Mai is your place. You'll come face to face with an ornate temple dazzled with jewels in honor of the Buddha on each corner you turn. Ceremony is an integral part of everyday life in Chiang Mai, and you'll definitely walk into one at some point in your stay (especially if you live with a local Thai family like I did). Don't forget to visit the Sunday market for fresh fruit, elephant and Buddha souvenirs, along with a pair of oh-so-comfy Thai fisher man pants! 3. Mykonos, Greece. This refreshing white and blue island feels as crisp as it looks (and it's the place I'm writing to you from). The deep ocean views stare back at you wherever you are, whether you're relaxing by the infinity pool, practicing your daily yoga flow, or indulging in an authentic Greek breakfast of fresh yogurt, honey comb, walnuts and figs. Mykonos is the perfect place to pamper yourself and let loose — all while having fun at one of the many beach lounges without the pretentious feel of south of France. 4. Formentera, Spain. This off-the-beaten path island is the quiet sister of Ibiza, with private beaches and to-die-for restaurants operated by some of Italy's best restaurateurs. Fun fact: More people speak Italian here than Spanish. Formentera is referred to as "la isla azul" because you'll be surrounded by turquoise blue waters that match a Tiffany’s box no matter where you go on this small strip of land. Love a little bit of luxe on a relaxing, serendipitous trip? With it's harbor full of yachts, Formentera is for you. 5. Cusco, Peru. The city closest to the world-famous Macchu Pichu, Cusco is a spiritual mecca for anyone who needs a more grounded and shamanic approach to spirituality — Ayahuasca optional. Cusco's mountainous climate and ancient Incan ruins are ideal for the more adventurous traveler who loves a bit of historical depth in their journey of self-discovery, and doesn't mind a bit of altitude acclimation (the city is a jaw-dropping 11,000 feet above sea level). Even more, there are many orphanages in Cusco that are open to receiving help, which will truly complete your experience and remains the highlight of mine. 6. San Juan del Sur, Nicaragua. Costa Rica is a top travel spot, but far fewer people venture to its neighbor country, Nicaragua. An up and coming hotspot, a trip typically costs a fraction of the price you'll pay to get to Costa Rica. San Juan del Sur is the most southern tip of Nicaragua and a total oasis in this country, offering rustic architecture, beachside sunsets and delicious Central American cuisine. In addition to lots of opportunities for yogis, there are also amazing ways to practice community service and get involved in town. I'll always remember the pre-school I helped build during the month I spent here. 7. Arambol, Goa, India. Do drum circles, hatha yoga, contact dance, and Tantra festivals call your name? If so, head to Arambol, Goa. This hippie town in the north of Goa (the southern tropical beach city of India) is for the more experienced traveler who seeks authenticity and flavor from their vacation without the frills of a typical yoga getaway; think beach huts with no electricity and ecstatic dance around a banyan tree. An Ayurvedic Practitioner, Arambol is the place I go to unwind and relax after an intense panchakarma experience. I’ve hosted retreats in Arambol and participants tell me they'd never imagined that this side of India even existed. 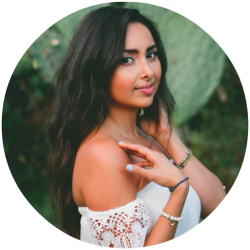 Sahara Rose is the author of the The Idiot’s Guide to Ayurveda and has been called “a leading voice in the millennial generation into the paradigm shift” by Deepak Chopra. She is a Certified Ayurvedic, Holistic and Sports Nutritionist and specializes in making Ayurveda easy to understand and follow so everyone can benefit from it's ancient wisdom. Discover your mind-body type with her quiz and follow her adventures on Instagram and her podcast, Highest Self Podcast. Below is the story of a serendipitous celebrity encounter with Steven Tyler — what could have been a simple sighting turned into a moment filled with life changing advice. By a serendipitous accident, I found a love for solo travel. I was in Barcelona, Spain, without friends for a few days because of a miscommunication around arrival dates. I arrived a few days early, disoriented and feeling a bit overwhelmed that I was in a foreign country. I didn’t speak Spanish or have functioning Google Maps on my phone. After the initial shock wore off, the next few days were unfettered by commitments, my own ‘identity,’ agendas, and deadlines. I wove around monuments, wandered around the city at my own pace, and discovered hole-in-the-wall gems. Since then, I’ve added a number more solo sojourns; sometimes for a slice of peace from the hectic and dark winters of the Big Apple (Sevilla, Spain was great for this), other times for some inner reflection or to visit friends abroad. Whatever your reason for going solo — conquering fears, getting to know yourself better, listening to your intuition, challenging yourself in new places and spaces — these are the my top tips. 1. Commit to making your trip happen. Set a hard deadline for when you'll leave. If you are like me and constantly can find an excuse to delay things (work, other commitments, etc. ), this hard deadline should be a pre-booked flight so it's a set plan after a certain point. I've heard that it's best to book flights one to three months in advance and that booking tends to be less expensive on a week day. Surf around the web before you buy to make sure you score the best deal; I love Holiday Pirates, Sky Scanner, and Kayak. You can also find error flight fares on Secret Flying, which is perfect if you have more flexibility in your schedule. Once you've bought your ticket, set an intention for your trip. Is this a museum tour of Paris? A food exploration of the Tuscany countryside? Will you go just to visit your friends in another place? Knowing will help you plan your budget, visits and excursions. 2. Plan in advance. Will you travel to SE Asia? Make sure that you have the right vaccinations and visa applications. Are you planning to backpack through Europe? If you're going with a United States Passport, know that you'll have just 90 continuous days across all Schengen countries in Europe for your stay. To keep up with rules, regulations and need to know info during my planning phase, I love to browse Nomadic Matt, Be My Travel Muse, and the CDC. The research, booking and planning part of taking a solo trip can get overwhelming, so don't be afraid to reach out to a friend for help. Even better if your buddy has been to the place you plan to visit! 3. Pack wisely. Most budget airlines in Europe and SE Asia have inexpensive airfares, but they'll only allow you to bring a single carry-on bag that weights between 7-10kgs. Choosing what you put in your suitcase can make a big difference in how comfortably you travel, and packing light is also the most sensible — after all, who wants to lug a huge suitcase up tons of steps or along cobblestone streets? Remember to bring a camera and your journal so you can commit your travel to memory along the way. 4. Let your experience unfold. Your first night might be a little disorienting and can feel a bit lonely, so be kind and gentle with yourself. On my first night in a new place, I call a friend, drink enough water, go to bed, and sleep through the night to get through jet lag. In the morning, I have my grounding rituals — these are meditation, yoga, water, a trip to a local coffee shop, and breakfast. Figure out what makes you feel good so you can start the day with a ritual of your own, no matter where you are. Get a true taste of your destination by traveling and eating like local whenever you can. My favorite thing to do in a new city is to join common interest groups like MeetUp, Couchsurfing, Internations, or even to stay in a hostel or Airbnb for a few days to meet like-minded travelers. You can even share a meal with locals through EatWith or Feastly — so cool! To keep it fun and fresh, challenge yourself to meet new faces in new places. Different cities make me feel like a different person, so I tend to err on loose free-flowing days with minimal planning. I make time for magic to find me in corner bookstores, small seaside shops, and excursions with strangers I've just met who’ve become close friends. Go with an adventurous spirit and discover how beautiful and serendipitous moments find you along your trip! Emily Chen is a freelance designer and illustrator. Her home is currently all over the world. She is passionate about food, shared experiences, new cultures. Below is the story of the first flip she received from friend, Eric Gertler. He encouraged her to write to the ambassador of every country she visited — surprisingly, almost every office responded, and she ended up at the US Embassy in Bangkok, chatting with the Counselor of Economic Affairs, and gleaning some great advice in the process. Happy Flashback Friday! We go back to four years ago this week, when Cara met honeymooners, Theresa and Stephen through a flip challenge. As fate (or serendipity!) would have it, their paths continue to cross, and the couple interviewed Cara for their podcast Ownstream. Check out the original story that brought their paths together. Who can you pay it forward to today?